I’ve played some Fortnite matches alone and with friends, but the game never it clicks with me. I don’t like building or dealing with expert builders. So I was excited to try out the previously PC only H1Z1, which recently started an open beta on PS4. While the basic setup of H1Z1 is similar to Fortnite, playing it feels very different. At times H1Z1 is much slower than Fortnite, and other times it’s faster and more chaotic. Unlike Fortnite, I can’t stop playing H1Z1. .
Battle royale games seem to be everywhere these days, but on console the genre is still relatively new. Of course there’s the uber popular Fortnite and for Xbox One players there’s also PlayerUnknown Battlegrounds and The Culling. Playstation 4 owners, however, haven’t had nearly as many options. The release of H1Z1 on PS4 changes that. Just like Fortnite, 100 players parachute onto an island in H1Z1. Players scavenge around the map searching for weapons and ammo. They also have to keep moving closer to each other as the boundaries of the map shrink throughout the game. Just like other battle royale games, the last person or team standing wins. While it might seem like H1Z1 is copying recent battle royale games, it should be noted H1Z1 is actually older than both Fortnite Battle Royale and PUBG, having first been released on PC in 2016. A big difference between Fortnite and H1Z1 is H1Z1’s lack of building and destructible environments. There’s no popping down a metal wall if someone is shooting at you. You won’t be able to build elaborate forts to hole up in. I never really liked constructing walls or defenses in Fortnite, and dealing with players who were really good at it was frustrating. Without the need to collect resources and build, H1Z1 feels lighter and more streamlined than Fortnite. The lack of building makes managing your inventory easier as well. Another major difference between Fortnite and H1Z1 is the armor system. Instead of finding armor potions as in Fortnite, H1Z1 players find helmets and chest armor pieces. This armor visually changes your character and if damaged enough will break and fall off. During one match, a friend of mine was sniped while peeking around a corner and his helmet disintegrated off his head. It was an intense moment! The biggest reason why I’m still playing and enjoying H1Z1 is the combat. Firefights in H1Z1 feel deadly and scary. Guns are loud and can be heard from far away. You can get pinned down by assault rifles, which is terrifying. Another interesting feature is H1Z1’s lack of any melee combat. Landing near other enemy players at the start of the match is a tense encounter. Players can’t attack each other, so everyone is searching desperately for a gun. The moment somebody finds one, I immediately want to get the hell away from them. H1Z1 matches feel like three different games. The first third of the match is usually slow. Most of the early minutes of the game are spent collecting weapons and gear. It’s also smart to keep an eye out for supply drops and hidden military crates. Both of these drops contain powerful weapons, strong armor and extra gear. As more people die and the circle gets smaller, most players will jump in cars and trucks. The middle part of most matches feels less like PUBG or Fortnite and more like Twisted Metal. Learning when to jump in and out of a car becomes key in this section of the match. In a car you are safer from small arms fire, but it is much harder to aim and shoot. Jumping out means exposing yourself, but if timed correctly you can usually catch enemy players off guard. The last part of most H1Z1 matches is a tense standoff. Usually 10 or so players are hiding in a small area of the map. Moving up when you feel safe, covering teammates or crawling to a new rock to take a potshot at someone is how you will probably spend the majority of the endgame. Occasionally some wild players will stay in their car or truck and try to cause chaos in these last moments, but they are usually killed quickly by everyone else. If you win, you get a crate. To open it, you shoot it—a neat spin on the sad art of opening in-game crates. If you lose, well you get some experience points and get ready to play again. H1Z1 is having some technical issues on PS4. Multiple matches I played in had friends get kicked due to their PS4 freezing or losing connection. Game invites didn’t always work, and parties sometimes get split up. Hopefully these issues get fixed over the next few days. As for microtransactions, they are purely cosmetic, and I never felt like they soured my experience with H1Z1. 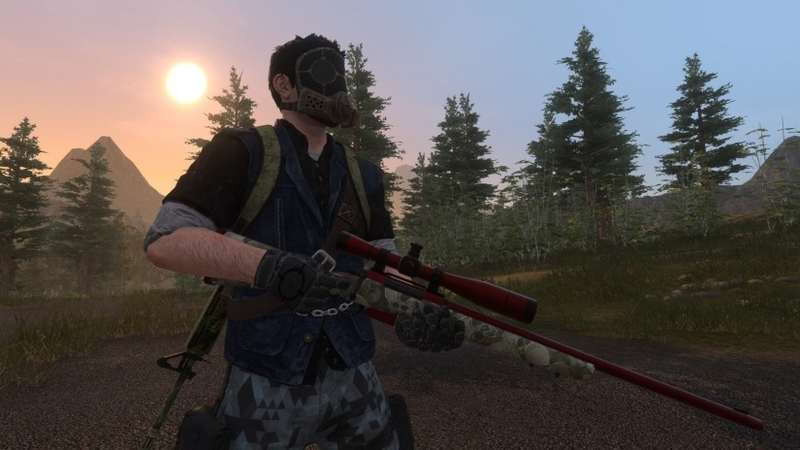 H1Z1 is a great battle royale game if you’re tired of Fortnite, never really liked it much, or just want to try a new game. It’s a fantastic alternative take on the popular battle royale genre and, considering the game is free-to-play, I recommend giving it a shot.